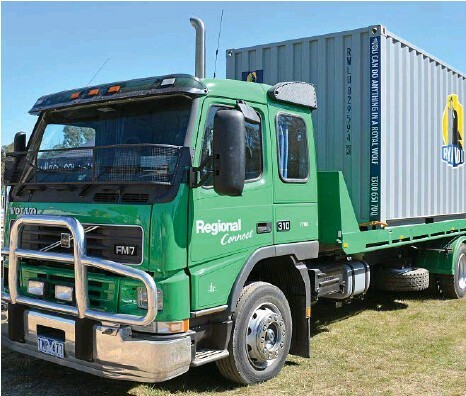 SITUATED just to the north of Albury-Wodonga, the Ettamogah Rail Hub stands out on the landscape, located adjacent next to the Hume Highway, with continual truck movements of containers and freight in and out of the facility. Operated by Regional Connect, the rail hub allows for seamless freight transition from truck to train and vice versa, with connections available Australia wide. Kellie Rees is the bsiness development and administration manager for Regional Connect and was promoting the company’s services at the recent Henty Machinery Field Days, along with displaying a range of road transport equipment the company utilises. Formerly based outside Wodonga on the old Cudgewa rail line, the move to the 20ha facility at Ettamogah has been a good move. “We had our first container movement here in 2009 – when the Wodonga bypass got put through it cut off our rail access so we looked at relocating – at the site here we have the rail siding, our warehouse for cross-docking and pallet storage and we have three pad areas here also for future warehousing opportunities,” Kellie said. The Regional Connect trucks work out of the rail hub and service a wide area, both in bringing freight into the hub for on-forwarding on the rail, and also the transport of containers and palletised freight once unloaded off the train. “Our trucks service the local area – a lot of our freight is within 150km of where we are located, but the trucks do go back and forth to Melbourne. We do have the option available if people need us to go further we can do that as well,” Kellie said. Given the nature of the business, a variety of transport equipment is put to use. The company runs a fleet of prime movers along with trailers ranging from Tautliners, skels, drop-decks and side loaders, along with a rigid with a tilt-tray which was built in-house in the workshop at Ettamogah. “We have the flexibility with options that suit the customer at their final destination. They might need a container loaded on the ground or if they have a loading dock we can use a skel,” she said. As the freight movement task has grown over the past decade, so too has the Ettamogah facility, with equipment upgrades allowing greater adaptability for customer requirements. “The last couple of years with the investment we have made into our trucking fleet has benefitted us quite a lot, we can offer additional services to the customer. We can offer a total supply chain solution and coming into the peak season towards Christmas the increase in trucks will start coming,” Kellie said. Volvo is the preferred option for the Regional Connect team, with the trucks all painted in a striking green paint scheme. “We have had a good run…we do love the Volvos!” she said. With a staff of seven, truck driving is a small part of being on the job at Ettamogah – an employee might be in the truck one day, driving the reach stacker shifting containers the next and then operating the locomotive shunting the train the day after that, with Kellie sharing some words that ring true that could be applied to any successful transport operation. “We are all multi-skilled and have a good team. If you have a good team behind you, you can get in and get the job done, that’s what it’s all about,” she said.